It’s hard to live in an apartment with a dog. A feisty, silly, still-a-puppy dog named Ajax. Nicknamed Pupper, Ajax Pupperopolis, Ajax Pupperknuckles, Sug (like Sugar), Buddy. He needs to go to the bathroom. People don’t want him to go to the bathroom. He is a nice dog but he has his needs. I feel bad sometimes and try to get him to go on yucky grass that people don’t care about. Some people do care about yucky grass, and that’s hard to predict, so it’s nice when they leave a sign. Pupper can’t read luckily, or he might feel bad. Poor peeing Pupper. This entry was posted in dogs, pets and tagged blogging 101, dog pee, dogs, nablopomo, nablopomolove, pets, photo 101, photography 101, pupper by Project Easier. Bookmark the permalink. This one made me very happy — not only because I love this guy, but I enjoyed the dissection of a daily routine that we take for granted. 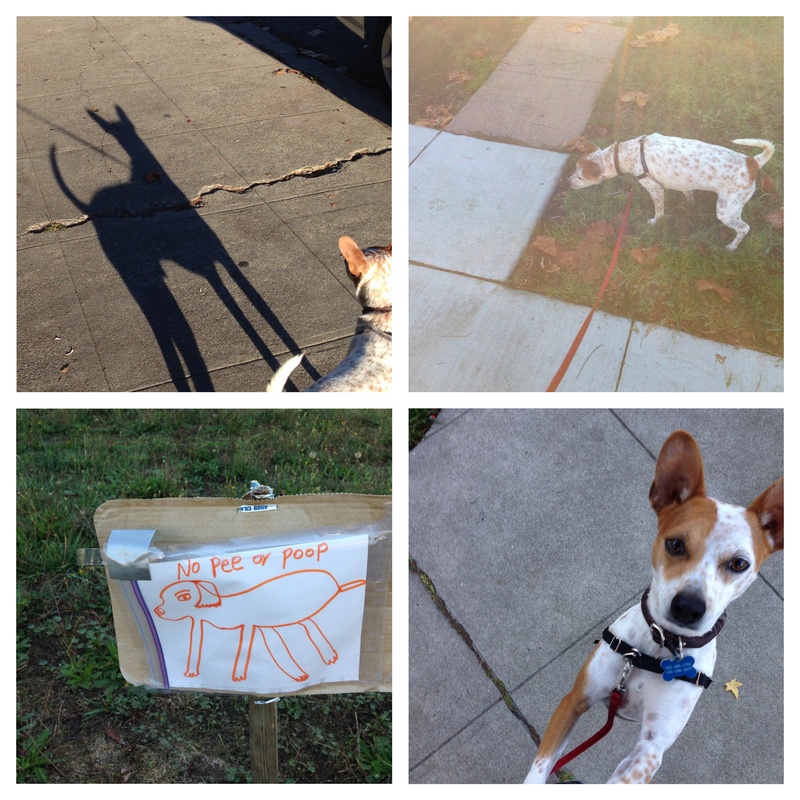 The photos are expressive, especially the one with the large shadow, perhaps giving us a glimpse of Pupper’s self-image. Totally Pupper’s self image. You’re right on! I just looked up Bolt and you’re so right! PUPPER is also quick-as-a flash. Thanks so much for reading! surely 🙂 thanks. Will check it out.